PHILADELPHIA (AP) — A halftime tongue-lashing from their head coach turned the Denver Nuggets around on both ends of the floor. 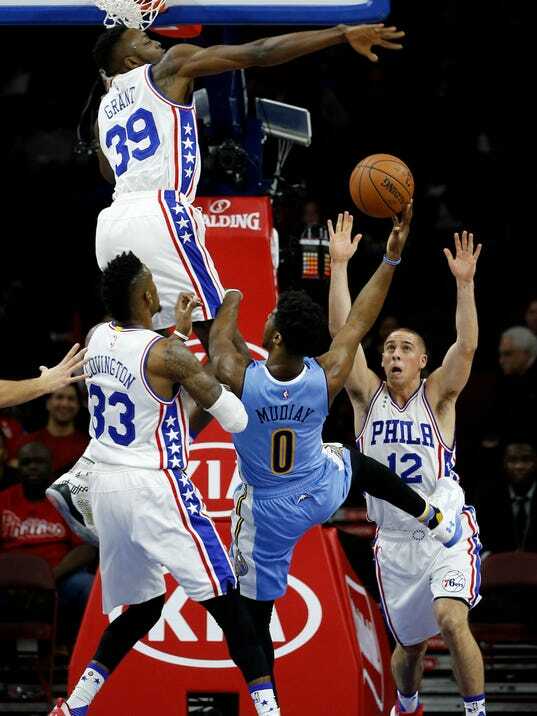 Danilo Gallinari scored 24 points, including the go-ahead slam dunk with under a minute remaining, to lead Denver to a 108-105 victory over the Philadelphia 76ers on Saturday. Robert Covington scored 18 points and Isaiah Canaan had 15 for Philadelphia, which dropped to 1-20. Philadelphia rookie Jahil Okafor sat out the second of a two-game suspension imposed by the team on Wednesday after the release of a second video from a nightclub fight in Boston on Nov. 25. Will Barton had 16 points for Denver, and the Nuggets ended a five-game trip by winning their second straight after snapping an eight-game skid on Thursday night. “I can’t imagine flying back tonight with a loss,” Gallinari said. It looked like the Nuggets were headed that way when they let Philadelphia shoot 60 percent from the field and 64.3 percent from 3-point range on the way to a 59-52 halftime lead.